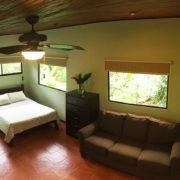 Enjoy this modern studio style suite with your own private balcony overlooking the pool and jungle! The Surf Costa suite is perfect for honeymoon couples, buddy trips, single travelers who want a bit more space, or couples with a small child on a budget. Add group surf or SUP instruction to your tour for $50 per hour long session. If you are booking lodging accommodations without a tour package, additional tours cannot be added on through our website. Please leave a note at checkout, and we will do our best to assist you in booking external tours for your stay.